Erasmus+ is the European Union programme for education, training, youth and sport and offers exciting opportunities for participants to study, work, volunteer, teach and train abroad. From June to August 2018 we were delighted to host Erasmus+ intern Valerie Etter at Castlefield Gallery. 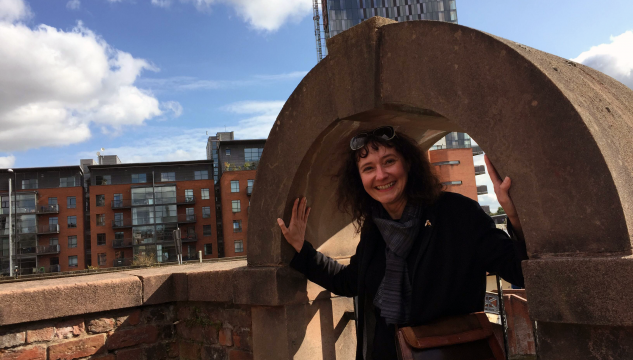 Valerie has written a short item for the Castlefield Gallery of her experience of Erasmus+, Castlefield Gallery and Manchester. I have always believed that the best way to improve and speak fluently in any new language, is to be immersed in the native culture. As a student, I have done some language and cultural travels, but I have not stayed long in the UK before now. Now, I am a teacher in History of Art in Strasbourg, in France, and at the same time, I have had an Erasmus+ internship at Castlefield Gallery in Manchester for three months this summer. It is never too late (to learn). I took advantage of an Erasmus+ grant (similar to Erasmus exchange for students) which is a European programme for people who are working on a project involving some language skills (and enables you to live in a foreign country and work for 3 – 6 months). Maybe it will not be possible in the next year to take part in the Erasmus+ programme to improve English in the UK because of Brexit which will be a shame (equally, many British students who would like to study or work abroad in a European country may not be able to do so), but I am glad that I have qualified just in time for this programme. The skills required to work in an art gallery are not completely new for me; I have previously worked in museums, libraries, and I have curated some exhibitions. But, what was very new to me, was to work in English! Everything becomes much more complicated, even basic tasks like writing an email or answering the telephone. Also, on my first day at the gallery, I was very surprised to have lost all my references on the computer keyboard – qwerty, and I usually use azerty – it does not seem like anything important but all your habits, all your reflexes are changed, and you have to adapt. During my time at Castlefield Gallery I have mainly supported the curator, Matthew Pendergast aka “Gass”, in different researches regarding upcoming exhibitions, and this part of the job is particularly exciting. Also, I don’t normally have the opportunity to do hands-on work, although I like that. Thus, I have really enjoyed assisting gallery technician James Ackerley in the realization of a structure for an aromatic immersive artwork for the summer exhibition. Last but not least, I have to say that I really enjoy life in Manchester, living, friendly, “arty”, uninhibited and I quickly adapted to it. I have never been in this city before and I hope I will come back in the future and maybe work again with Castlefield Gallery.